Social media is where people connect and the more connections you make, the better. But it takes effort to grow your network. And expanding your circle should always be on your list of social media to-do’s. 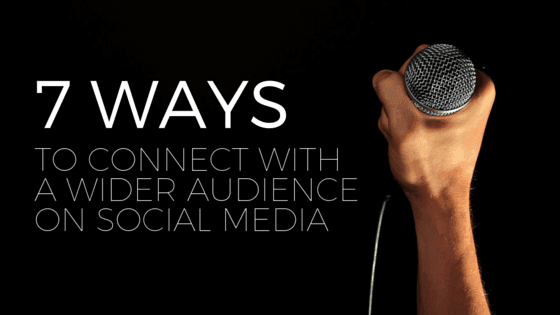 Whether you want more fans or to reach a new group of people with your message, here are seven ways to maximize your audience on social media. 1. Include photos and videos in your posts. In the huge amount of information that gets shared on social media, it’s important to stand out. Photos and videos grab people’s attention and get more recognition than text-only posts. Content with relevant images gets 94% more views than content without. So don’t forget the power of photos and videos to get more eyes on your content. Hashtags allow people who search for that topic to see your post and posts with hashtags see more engagement — tweets with one or more hashtags are 55 percent more likely to be retweeted. They’re great for connecting with people who are interested in what you do, even though they might have never heard of your business before. 3. Work in some calls-to-action. Including calls to action on your content lets your followers know what you’d like them to do next. And the right CTAs can get your content in front of the right people. Include CTAs to like, share, comment, and follow — just asking can go a long way in creating more buzz about your content and brand. If all you do on social media is promote your business, your followers will get bored. Promoting another business your customers might be interested in can vary your content and even better — it might cue them to promote your business to their followers. People love them — offer a freebie to your social media followers and people will rush to engage with you. Sometimes a little incentive is all it takes for people to follow, like, or call you out on social media. And that means a bigger audience for you to share your story with. 6. Invest in paid advertising. Creating a wider audience isn’t always free, but investing in paid advertising definitely creates opportunities to target potential customers. A lot of marketers are factoring social media advertising into their budgets because it works. Paying for a sponsored or promoted post can expand the reach of your content. Each social platform attracts a unique audience. That’s why cross-promoting your platforms can be super effective in attracting new followers (E.g., telling your Facebook followers to find you on Instagram). If you create a new profile, promote it on your existing ones and occasionally remind your followers where else they can find you online. We know managing your social media is a lot of work. That’s why we’ve developed social media management tools that do some of the work for you. Call us at 844-207-9038 or email hello@mopro.com to learn how we can help you get connected online.